ABERDEEN PROVING GROUND, Md. (Feb. 18, 2015) -- Researchers are refining for Army use a commercial technology that will allow Soldiers to accurately and rapidly detect an array of chemical and biological hazards - from mustard agent to anthrax - and then transmit those results to their higher command. At the same time, the technology is smart enough to differentiate between those chemicals which are dangerous and those that the Soldier has carried with him into the environment on his own skin, such as bug spray or hand sanitizer. 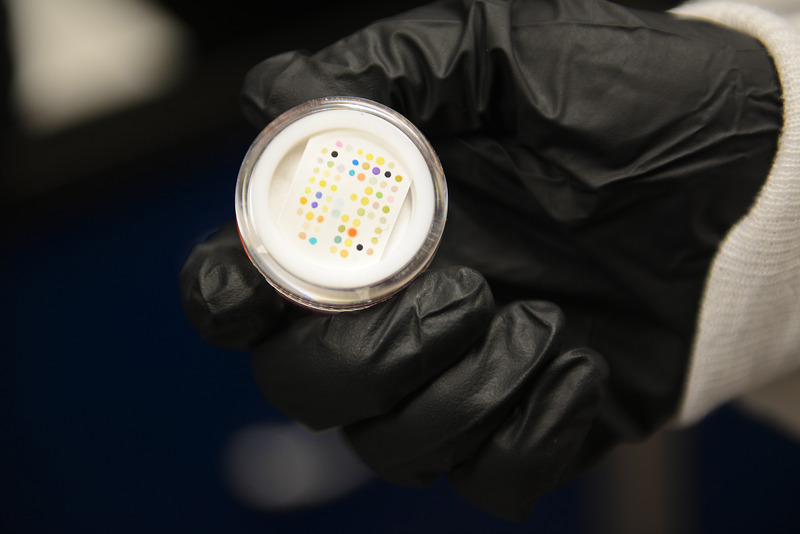 This colorimetric detection assay, about the size of a postage stamp, is printed with a grid of several dozen indicator chemicals arranged in a grid of small dots. The VOCkit system is a small electronic device developed at the Army's Edgewood Chemical Biological Center, or ECBC, and even manufactured there, for now, on the center's 3D printers. The device reads the result of chemical detection paper and can then transmit the results into the Army's network via the Soldier-worn "Nett Warrior" smartphone system. At the heart of the system is a colorimetric detection assay, a swatch of paper about the size of a postage stamp, that is printed with a grid of several dozen indicator chemicals arranged in a grid of small dots. Each dot is made from a differently-colored indicator chemical that will have a unique color change in response to any compound it comes in contact with: from chemical threats, to biological threats, to common household cleaning products and cosmetics. "You have almost one hundred reactions going on and the combination of those reactions gives you a unique signature," said Peter A. Emanuel, Ph.D., ECBC's BioScience division chief. "Some react, some don't ... some intensely. The signature, the collection of those dots, gives us a unique fingerprint for what that agent is." The colorimetric detection assays they are using are placed inside a small plastic hockey puck-shaped cartridge that has a removable plug on one side. Researchers can open that plug and put a drop of a test substance inside so as to expose the assay to a chemical. The odor of whatever chemical is being tested interacts with the assay to create reactions - or a lack of reaction - among each of the indicator chemicals. "Everything emits an odor, essentially, even if you can't distinguish it," said Aleksandr Miklos, Ph.D., a senior scientist at ECBC. "Virtually everything that's out there emits something of itself into its environment. That's how your sense of smell works." Miklos said the detection assays perform a function similar to a human nose. "This is essentially a little piece of paper that does what your nose does," Miklos said. "It is not quite as good as your nose in some regards, but better than your nose in others." Miklos said a human nose has a "couple hundred" receptors to recognize odors. But that doesn't mean that a nose is capable of recognizing only a couple hundred odors. "You can actually recognize up to a billion odors," he said. Miklos said that chemical receptors in a human nose don't each detect one smell. "There isn't one receptor in your nose that is for the scent of a rose," he said. "Everything you smell triggers every receptor to a slightly different extent. And what your brain does - it's very clever - is it recognizes these patterns. Odors establish a pattern in your nose and your brain recognizes it. Odors establish a pattern on this assay." The colorimetric assays have at least one distinct advantage over the human nose, Miklos said. "A human could not sniff a container of sarin, because you would die," he said. "But the paper ticket doesn't care." Melissa Dixon and Aleksandr Miklos, Ph.D., a senior scientist at Edgewood Chemical Biological Center, Aberdeen Proving Grounds, Md., are refining for Army use a commercial technology that will allow Soldiers to accurately and rapidly detect an array of chemical and biological hazards - from mustard agent to anthrax - and then transmit those results to their higher command. The colorimetric assays react differently to a variety of chemicals, Miklos said. But in the case of existing, fielded colorimetric strips, two chemicals might produce very similar results. 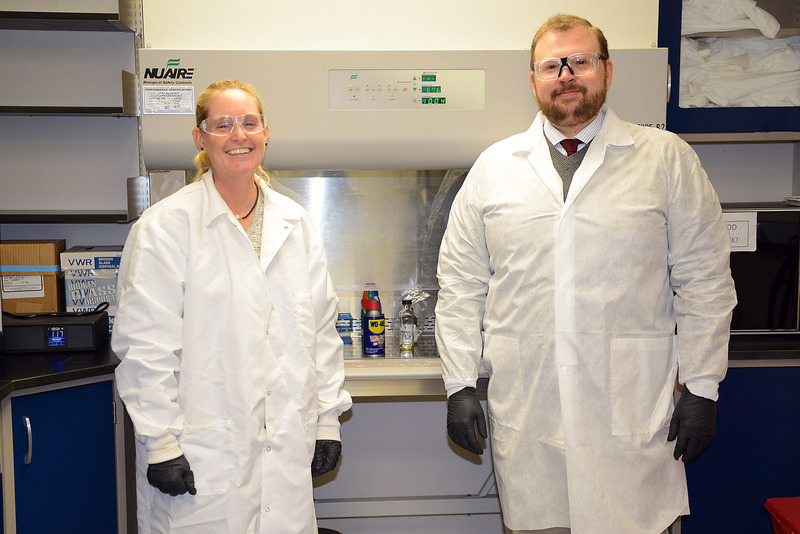 So he and team member Melissa Dixon are testing the colorimetric arrays against a variety of products commonly used by Soldiers to ensure that if something like rifle cleaner indicates the same chemicals as sarin gas, Soldiers will know about that. "The problem is that common stuff confuses the strips," said Miklos of the currently-fielded strips. "We know certain solvents will look a lot like VX. That's not particularly helpful." In his lab, Miklos and Dixon are exposing the arrays to common chemical items: lotions, bug sprays, lubricants, fuels, baby wipes, alcohol, etc. "We want to use them to make sure we are not getting any kind of cross-reactivity," Dixon said. "If Soldiers clean themselves with baby wipes, we want to have a background for baby wipes, as opposed to being VX." Dixon's husband is a Soldier, she said, and he provided her and Miklos with some common items that Soldiers use in the field so that those could be tested. Miklos and Dixon are building a database of colorimetric array reactions to a variety of common, relatively safe chemicals. On the other side of ECBC, Miklos said, in labs equipped to handle more dangerous materials, they are exposing the assays to more dangerous things, like VX. Already, ECBC has a device called the SmartCAR, short for "smart color-metric assay reader." That hand-held device was developed by ECBC engineer Colin Graham. The SmartCAR does not read the same color-metric assays that Miklos and Dixon are working on - the ones with the array of colored dots - but instead uses electronics and a camera to read test strips similar to a pregnancy test. Those strips are in common use today in the Army, and they can evaluate for one biological agent at a time. Graham designed the circuit boards for the device and wrote the software for it. The shell for it was built in-house on ECBC's 3D printers. He said from concept to completion took about six months. The "SmartCAR" system, short for "smart color-metric assay reader," uses electronics and a camera to read chemical warfare agent test strips that are similar to a commercial pregnancy test. The SmartCAR was evaluated recently in South Korea during an advanced technology demonstration that explores bio-surveillance, Emanuel said. In South Korea, the device was used in the field by Soldiers during scenarios that involved anthrax and plague. "What they did was they ran the assays and it got the result, it interpreted the result, it told them what the answer was and then it immediately uploaded it to the cloud and put it up on a screen so that anybody in Korea could see," Emanuel said. "The advantage is that the machine takes the ambiguity out of the read, and also uploads and archives the image so that every battlefield commander can see what's going on. It shows up like a little pin on Google maps." The SmartCAR, in conjunction with the Nett Warrior device, can run the evaluation, capture the results, and transmit the results, along with latitude, longitude and time to a central location on an Army network so that it can be used by commanders, Emanuel said. Emanuel said he envisions a scenario where multiple Soldiers are running similar evaluations across a theater, and their results are plotted real-time for commanders to see the result. "That's the whole idea of bio-surveillance, it's not just being able to see things, but see them in real time and have everybody see them," Emanuel said. "What we are trying to do is inform the common operating picture." Emanuel said they'll take the device back out in June for another evaluation. The new VOCKit system that ECBC is developing will read the colorimetric arrays that Miklos researches in his lab, growing detection functionality beyond the SmartCAR. "We are trying to move away from one ticket one test, to one ticket many tests," Emanuel said. "Then it evaluates and beams from the evaluator to the phone and into a cloud where everybody can know what's going on." Emmanuel said that the goal is for these technologies to ultimately replace the ECBC-developed M8 and M9 chemical detection paper currently used in the field today. "It's [M8 and M9] indicator paper and they touch liquids, and it turns like blue, and they say they think it might be something," Emanuel said. "But the new tickets instantaneously and vividly not only indicate, but tell you exactly what the liquid is. We are moving quickly to replace M8 and M9 paper with a new kind of indicator paper. We are creating a dipstick that will tell you what that chemical was. This has applications for the Soldiers. It could be used for customs agents." Emanuel said ECBC expects to have a working prototype in about 18 months. The Edgewood Chemical Biological Center is part of the U.S. Army Research, Development and Engineering Command, which has the mission to develop technology and engineering solutions for Americas Soldiers. RDECOM is a major subordinate command of the U.S. Army Materiel Command. AMC is the Armys premier provider of materiel readiness -- technology, acquisition support, materiel development, logistics power projection and sustainment -- to the total force, across the spectrum of joint military operations. If a Soldier shoots it, drives it, flies it, wears it, eats it or communicates with it, AMC provides it.